The Oriskany Sandstone is overlain by a cherty Onadaga Limestone and/or the Needmore Shale (Oliver and others, 1967; Milici, 1996). This interval is somewhat effective as a top seal, but it may be permeable in areas because of fracturing. However, the Onadaga Limestone/Needmore Shale interval is overlain by a thick section of Middle Devonian black shale, which makes an excellent regional confining layer. For the GIS, we chose the map of Oliver and others (1967; their fig. 8), which shows the distribution of lithologies of the Middle Devonian black-shale sequence. This sequence is widely interpreted to be laterally continuous, deep-water black shales (Oliver and others, 1967; Roen and Walker, 1996). 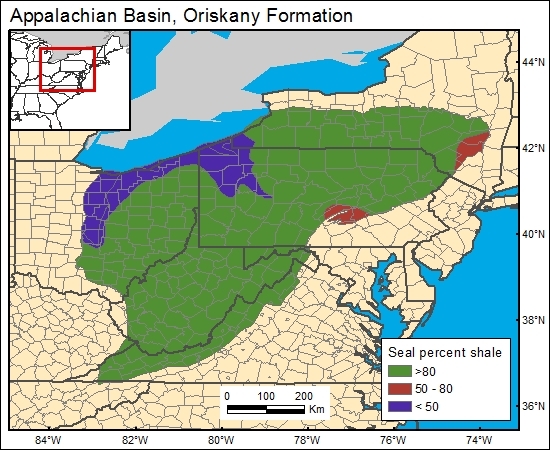 Milici, R. C., 1996, Stratigraphic history of the Appalachian Basin, in Roen, J. B., and Walker, B. J., eds., The atlas of major Appalachian gas plays: West Virginia Geological and Economic Survey Publication V-25, p. 4–7. Oliver, W. A., DeWitt, W., Jr., Dennison, J. M., Hoskins, D. M., and Huddle, J. W., 1967, The Appalachian Basin, United States, in Oswald, D. H., ed., International Symposium on the Devonian System: Calgary, Canada, Alberta Society of Petroleum Geologists, p. 1001–1040. Roen, J. B., and Walker, B. J., eds., 1996, The atlas of major Appalachian gas plays: West Virginia Geological and Economic Survey Publication V-25, 201 p.